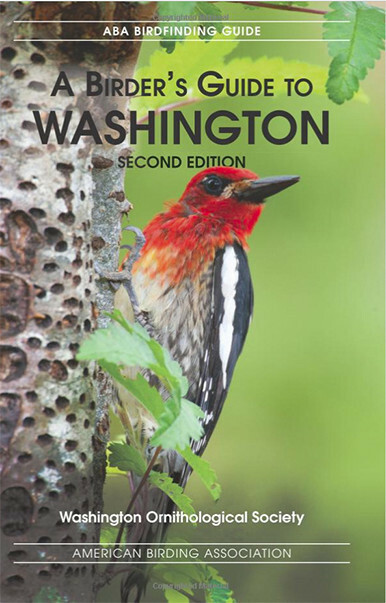 This website is the online version of A Birder’s Guide to Washington, Second Edition, a 613-page birding guide for Washington State published in 2015. Members of the Washington Ornithological Society (WOS) were the book authors; publisher is the American Birding Association (ABA). This website is intended to be a way to update and keep current the content of the book. We encourage any and all birders to leave comments about the areas covered in this guide. The sponsors of this Website are the Washington Ornithological Society and the American Birding Association. Changes made to the bird-finding guide text on this website may incorporate information or wording from public comments submitted to this website. The changed text on the Washington Ornithological Website is copyrighted by the Washington Ornithological Society, whether or not changes to the text derive from comments submitted to this website. Curators – See the list of curators here. WOS was chartered in 1988 to increase knowledge of the birds of Washington and to enhance communication among all persons interested in those birds. WOS provides a forum for birders from throughout the state to meet and share information on bird identification, biology, population status, and birding sites. Over 400 enthusiastic birders— from backyard feeder watchers to professional ornithologists—belong to WOS. Membership is open to all persons interested in birds and birding. A bimonthly electronic newsletter with news and information about the society, birds, birders, habitat, sightings, and other topics. Washington Birds, our scholarly journal, previously mailed to all members upon publication, now published online. Several earlier printed versions are available online at our website. Washington Field Notes, a regular report on noteworthy sightings from around the state. The Patrick Sullivan Young Birders Fund, which gives grants to young birders for birding activities or study. Monthly programs held on the first Monday of each month (except July, August, and September). Attend either remotely via the Web or in person at the Center for Urban Horticulture on the University of Washington Seattle campus. Meetings feature refreshment, socializing, and interesting programs. WOS Annual Conference, open to all members. Held in a different part of the state each year, the conference includes speakers, workshops, identification contests, and field trips. Field trips for members throughout the year to all areas of the state. The Washington Bird Records Committee, which maintains the official state bird list and birding records that substantiate it. The committee decides whether to accept reported sightings of rarely seen species or new species and publishes reports on its decisions. The state checklist of birds, prepared by the Bird Records Committee. Offered in various convenient formats for carrying in the field, downloading, or printing out. Dues are $25 for an Individual, $30 for a Family, $15 for a Student, and $500 for a Lifetime membership. WOS is a non-profit organization under section 501(c)(3) of the Internal Revenue Code. Recent WOS Presidents overseeing the guide: Jack Stephens, Dan Stephens, Penny Rose, Jim Danzenbaker. For the full listing of WOS officers, staff and board members, go to the WOS website and look under the “About WOS” menu. When you become a member of the American Birding Association, you join thousands of birders who are eager to improve their knowledge and skills to get the most out of their birding experiences. Network with friends and share the passion of birding. Learn more about birds and birding. Sharpen and augment your birding skills. Participate in workshops, conferences, and tours. You don’t have to be an expert birder to be a member of the American Birding Association. You’re qualified simply by having a desire to learn more about birds, their habitats, and how to protect them. ABA membership offers you the opportunity to meet and learn from experts and to improve your skills through our internationally attended conferences and conventions, Institute for Field Ornithology workshops, specialized tours, and volunteer opportunities. It is great way to get to know others who share your interests. For the full listing of ABA officers, staff and board members, go to this ABA webpage.